 Spencer Conway is at it again, crossing continents on his trusty Ténéré 660. You may have heard of Spencer Conway before. 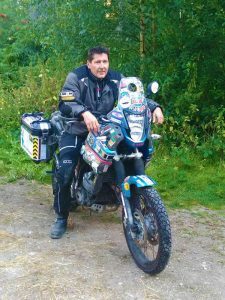 Six years ago he circumnavigated Africa riding through 34 countries, covering 34,000 miles (55,000 km) solo and unsupported, on a Yamaha XT660Z Ténéré. The Travel Channel made a six-part series about his journey called the Africa Motorcycle Diaries and it also became a DVD. Spencer Conway just began another big adventure of equal magnitude a few days ago. This time, he is in talks for a deal with the Travel Channel for a 12-part series following his counter-clockwise circumnavigation of South America. He’ll be traveling through 11 countries total, some of which are among the more unstable in the world. The journey is expected to take roughly a year covering an estimated 31,000 miles and he’ll be traveling on a tight budget. Spencer will be riding the same Yamaha XT660Z Ténéré from his African journey, despite being offered two sponsorship deals from bike manufacturers. He turned the offers down simply because he thought it would be “cool” to ride the same bike around two continents. He’ll also be riding solo once again, with no support trucks or film crew following him. And to make things even more interesting, he plans to navigate the entire time with only paper maps and a compass. That’s right, no GPS! “I just want to get lost,” Spencer explains. Sounds like Spencer’s trip has all the components for a true adventure. But if he finds himself in a situation he can’t handle, he’s also carrying a SPOT 3 GPS Messenger/Tracker that will bring help with the push of a button. The journey will also be tracked continuously with the SPOT, so people can follow his movements live on his website. But it looks like Spencer had to get on his way before his website was completed. Its expected to be up soon though. You can follow Spencer’s journey on his website at www.spencer-conway.com or on his Facebook or Instagram pages.